Macy’s, the American department store chain, is celebrating the 90th Macy’s Thanksgiving Day Parade with “Old Friends”, a commercial featuring a Santa character ballon. Since its origin in 1924, the Macy’s Parade in Manhattan’s Herald Square has marked the official start of the holiday season, stopping only for the World War II years of 1942, 1943 and 1944. The Macys Old Friends commercial follows a young boy from his first Macy’s Parade experience in the 1940s through to his 90th year, as the Macy’s Thanksgiving Day Parade plays a special role in his life. 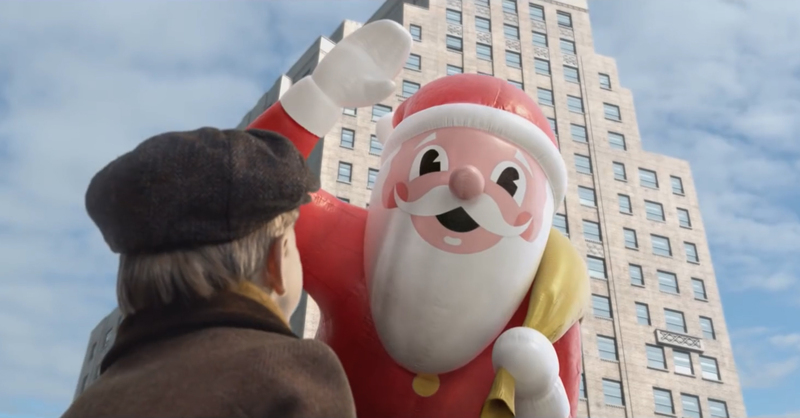 The Santa balloon in the commercial is a fictional character, devised through VFX at MPC. The 2016 parade features 16 giant character balloons, 27 novelty/ornament balloons, balloonicles and trycaloons, 26 floats, 1,100 cheerleaders and dancers, more than 1,000 clowns, and 16 marching bands and performance groups. We first see the Macy’s Old Friends hero in what appears to be the 1940s, then in successive decades as he grows to manhood and into old age. Each year, the Santa balloon singles him out for a special wink, which he meets with a wide smile. The action is interrupted, however, when in the final parade scene Santa looks for him but he’s not there. Concerned, Santa breaks from the parade route and is seen floating over the Manhattan skyline and the George Washington Bridge. He heads north, over the lush, rolling hills of upstate New York, vivid in autumnal colors, until a house appears in a clearing. As the camera moves in closer, we see our hero sitting alone in a room by the window. He looks out and sees Santa, who gives him a knowing wink. With this, Santa returns to the parade, glad to know his old friend is still around. The Macys Old Friends campaign was developed at BBH New York by creative chairman John Patroulis, chief creative officer Ari Weiss, creative director/copywriter Hemant Anant Jain, creative director Shannon McGlothin, head of content production Kate Morrison, executive content producer Abbie Noon, head of business affairs Sean McGee, global chief strategy officer Sarah Watson, group strategy director Samantha Cescau, global business director Jill Cavanagh, and account director Jennifer Sunberg. Filming was shot by director Noam Murro via Biscuit Filmworks with director of photography Simon Duggan, executive producer Rick Jarjoura, producer Charlotte Woodhead, head of production Shawn Lacy. Editor was Stewart Reeves at Work Post with assistant editor Adam Witten, executive producer Erica Thompson and producer Sari Resnick. Sound was designed at Henryboy and mixed at Sound Lounge by engineer Tom Jucarone. Music was composed by Philip Kay at Woodwork Music with producer Andy Oskwarek. Visual effects were produced at MPC New York by managing director Justin Bruckman, executive producer Camila De Biaggi, senior producer Brendan Kahn, VFX supervisor Ashley Bernes, lead Flame artist Amanda Amalfi, lead CG artist Andrew Cohen, and colourist Mark Gethin (LA), color executive producer Meghan Lang, color producer Rebecca Boorsma, 2D compositors Tobey Lindback, Elijah Lamond, Karen Weiss, Leslie Chung, Jeric Pimentel, 3D artists Butch Belair, Mike Lombardo, Chris Ribar, Graeme Revell, Angela Carafas, Jacob Fradkin, Sue Jang, Laura Sayan, Monica Manalo, Madeline Jackson, Liz Martin, Michael Nieves, Andres Weber, David Kin.